One of our customers asked us to develop a easy to use store locator web application for his website, using Google Maps and nice icons to map the different dealer locations. This was not a simple store locator with a few hundred or thousand addresses, but over 70,000 addresses in various categories/branches had to be displayed. We used the web-version of our software “GeoCoder Pro” to geocode the addresses and finetune the results. Within an hour the geocoding process was finished and the result could be exported used for the store locator software. 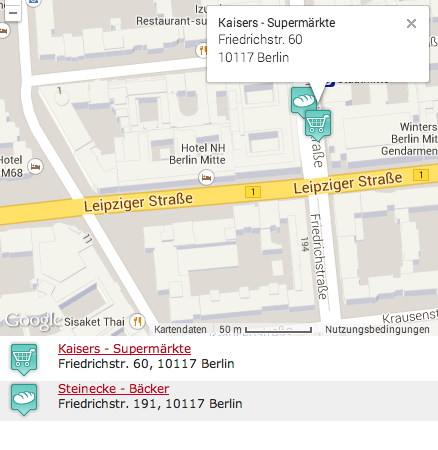 A store finder has just a simple task: show the customer the locations the user has asked for. Entering an address and showing the result on a map is the main task of a dealer locator. We used the latest Google Maps technology for this part. With AJAX and clustering the browsing experience is very fast and intuitive for large areas and also for non-experienced user. The displayed dealer addresses are also located below the map – with additional information as e.g. the branch or contact information. The requirement was that they should be styled similar to the website. When the user clicks on the icon, the map position is highlighted. Only dealerships being display currently on the map are displayed in the list. Interested this store finder solution? Contact us – we have a lot of experience in web applications and geo/map-based technologies and therefor can deliver outstanding solutions within a short time and for an affordable price!